My husband Greg’s great aunt was Mary Ann Nichols, formerly Lack nee Whiteman (1884-1945). She was the daughter of Robert Henry Whiteman (1839-1884) and Sarah Jane Young formerly Whiteman nee Way (1863-1898). When I first started researching our family history Greg and I looked through a postcard collection that his father Peter Young (1920-1988) was given by Greg’s grandfather Cecil Young (1898-1975). At first we didn’t know who the people mentioned on the cards were. Nor did we recognise the place names. When we saw ‘Timor’ on one of the cards we thought it was a reference to the island of Timor to the north of Australia, not – what it was – a gold mining town in central Victoria! The notes from our research 25 years ago show some of the things we learned from reading the cards carefully and looking carefully at the postmarks and addresses. 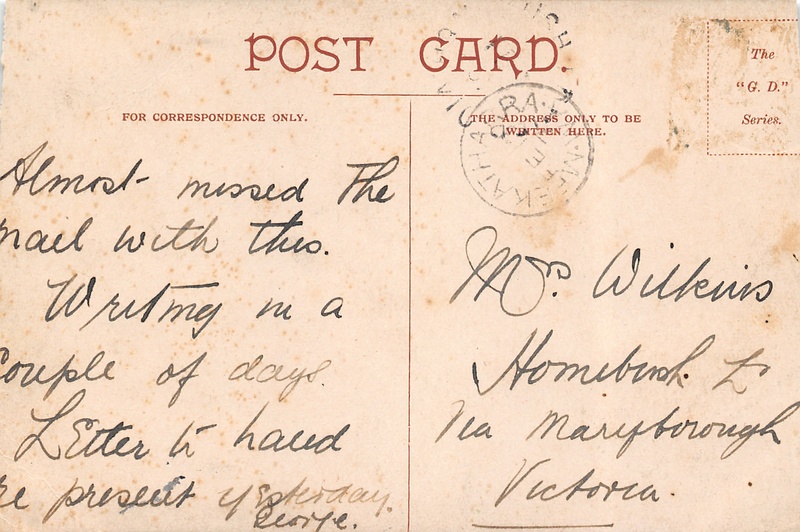 Conclusions from the transcribed postcard collection. This collection was passed from Cecil to his son Peter. 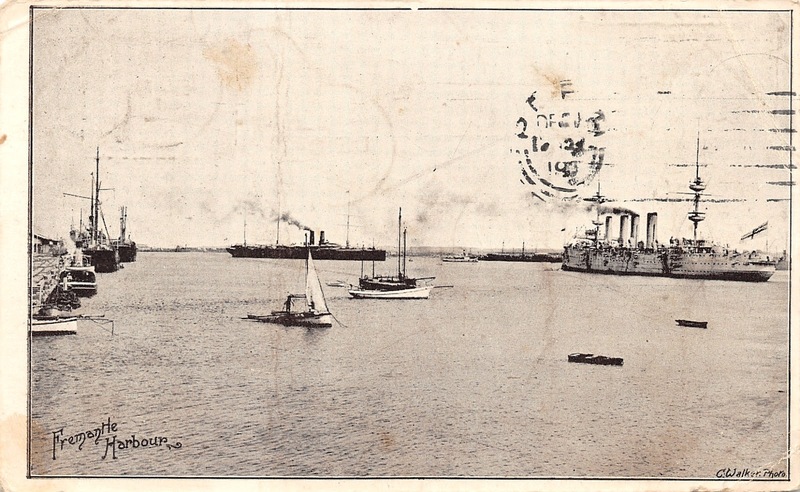 The postcards were mainly addressed to Cecil’s brother Jack. From at least July 1906 to after 1911, Jack and Cecil lived with a Mrs GE Wilkens in Lower Homebush. Bob Whiteman (Jack and Cecil’s half brother) referred to them as Aunty and Uncle. He also referred to Lora (a daughter?). Mr George E Wilkens is a teacher at Lower Homebush school from at least 1899 to at least 1916 according to Wise’s Victorian Post Office Directory. In ‘Avoca the Early Years’ a George Wilkens is mentioned playing the cornet. Cecil and Jack’s father, John Young, was not living with his sons. 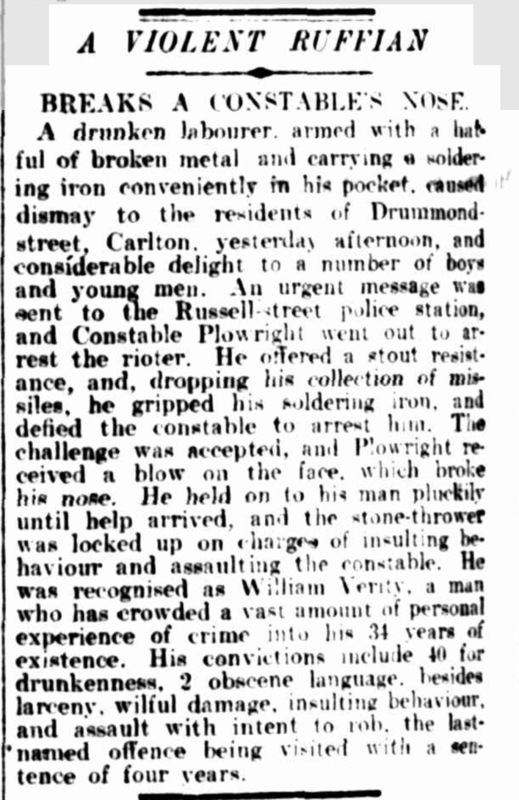 In 1907 he was in Barringhup, Victoria. In 1909 he was at Burnt Creek or Middlebridge. After 1911 Jack and Cecil moved to Clunes. At one stage they are with or near Aunt Harriet and her children. At another stage Jack lived in Service Street Clunes. According to another post card Cecil lived with a Mr Thomas, Fraser Street, Clunes. Bob Whiteman (Jack and Cecil’s half brother) was living at Moriarty in Tasmania at least between 1906 and 1911. Jack and Cecil’s half sister, Mary, lived at Homebush in 1909. We have since learned much more. We now know that Mrs G.E. Wilkins was Charlotte Wilkins nee Young (1861-1925), who was married to George Wilkins (1857-1944), a schoolteacher at Homebush, Victoria, not far from Avoca. Charlotte was the sister of John Young (1856-1928), father of Cecil and Jack. She was the twin sister of Harriet Richards nee Young (1861-1926) who lived at Clunes. Mary Ann Whiteman was born 19 August 1884 at Parkes, New South Wales, the second child of Sarah Jane and Robert Henry Whiteman, a miner. Robert Henry Whiteman had died of pneumonia in February 1884, six months before Mary was born. Mary had an older brother, Robert Henry (Bob) 1883-1957). In September 1894 Sarah Jane married John Young, a gold miner, in Melbourne, Victoria. Mary was then aged ten and her brother Bob aged 11. 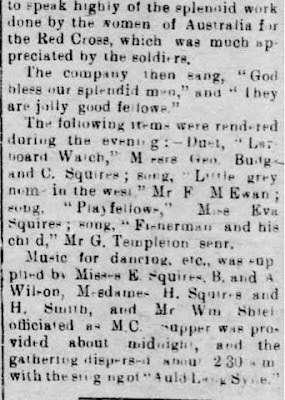 Sarah Jane had earlier given birth out of wedlock to another child (Leslie Leister) in 1894, but left him in Parkes to be brought up by her mother and sister. It seems that Bob and Mary came to Victoria to live with John Young and Sarah Jane. Sarah Jane died of postpartum haemorrhage the day after Cecil was born. John Young was left a widower with two step-children, Bob aged 14 and Mary aged 13, and two infants: Jack, almost two, and the newborn Cecil. It appears that John’s sisters looked after the children. Jack and Cecil grew up mainly in Homebush, cared for by their aunt Charlotte. John Young with his step children Bob and Mary Whiteman and his sons Jack and Cecil Young. Photograph taken 1898-9. A copy of this photograph came from the Tunks family (relatives on the Young side) but a copy is also held by the Way family (relatives of the children’s mother). There are four postcards in the collection signed by Mary. It seems that Mary called Charlotte ‘Aunty’ and spent time at Homebush. It is hard to tell in what order the postcards were sent. Mary, it appears, was living with a Mrs Thomas in Stawell (75 kilometres west of Homebush and Avoca). She was presumably Mrs Thomas’s servant. Dear Jack I am sending you this to let you see that I have not forgotten you, I do wish the you Cecil would write me a letter and tell Aunty to write also I do wish I could see you. I hope to come down at Xmas time. Love to all your loving sister Mary. Dear Aunty Just a line to let you know that I will be coming down to see you on Friday morning. Mr T is in Avoca and Mrs T is going down so she is going to pay my fare and I am coming down to see you. Hope all are, love from Mary. My dear brother Jack. Just a card hoping you are all well as it leaves us all nicely at present, how do you like being at Clunes. I think that you will like it better than Homebush. It will be livelier for you, give our love to Harriet and all the children, how did you spend Xmas. Well dear wish you all a happy new year, with love from Jim and Mary. 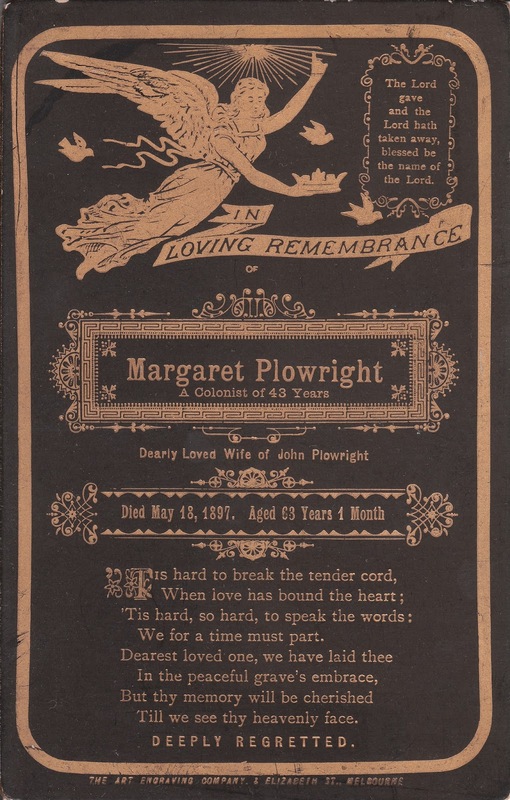 The fourth card is to Miss Eva Hogan (1889-1913). She lived at Homebush and in 1910 married James John Cross (1886-1963), also a relative of Greg’s, his great uncle, but on a different branch of the family. Dear Eva Just a line hoping you all are doing well, & did not get washed away. Tell dad Gus wrote to Charlie to give him a show if he gets it, that is all we know at present. When are you coming to see us. Give love to all from all yours Mary. 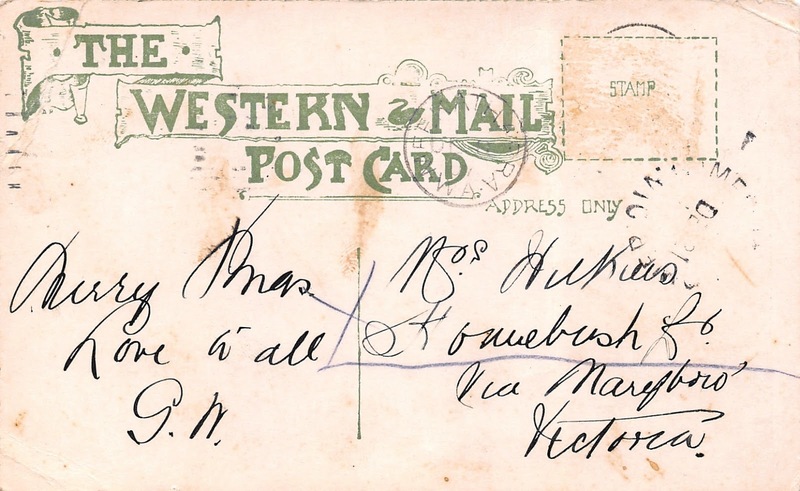 Addressed to Miss E Hogan Bromley near Dunolly and postmarked 6 August 1909. Mary and Jim Lack had three boys. In 1925 she and Jim Lack were divorced. In the same year she remarried Henry White Nichols (1873-1959), a widower. They had one daughter. John Young lived with the Nichols family in Melbourne for the last years of his life. He died at the age of 72 in 1928. In 1945 Mary died aged 63. John Young and Mary Nichols are buried together in Footscray cemetery. In 1916 during World War I the Australian Government felt that the recruitment of volunteers was not providing sufficient men for military service. 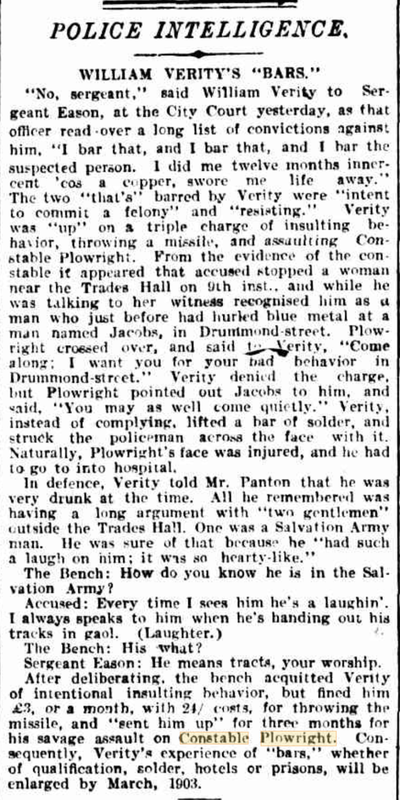 Two plebiscites seeking to conscript men for overseas military service were held, one in 1916 and the second in 1917. In both cases the proposal was voted against and Australia sent only volunteers to fight in the war. The Prime Minister, William Morris Hughes, returned from Britain and France in July 1916 determined to introduce conscription. Britain, soon followed by New Zealand, had introduced compulsory military service in January 1916. Hughes believed that unless Australia was absolute in its support of the war effort, the nation might not get a full say in peace discussions where matters of Australian concern would be decided. This plebiscite is often referred to as a referendum but this is technically wrong. A referendum decides constitutional issues; no constitutional issue was in question, the plebiscite was really just seeking consensus for the legislative changes required to introduce conscription. However, the word `referendum’ was used at the time and has remained the accepted nomenclature. 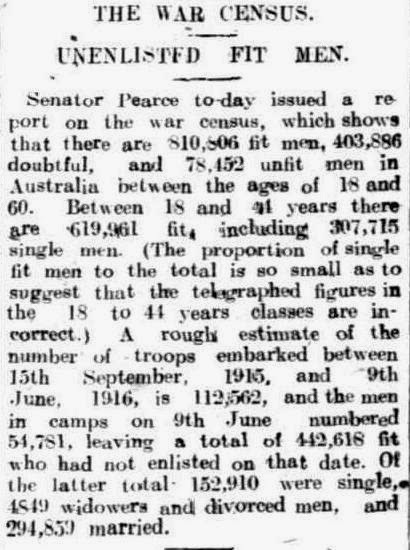 A `War Census’ was taken between 6 and 15 September 1915. All males aged between eighteen and sixty years were asked their name, address, age, marital status, dependants, general health and debilities, current occupation and any other work they could undertake, military training (if any), numbers and descriptions of firearms in their possession, place of birth (and place of birth of father and mother) and, if relevant, naturalization particulars. On the basis of information collected from this census, the Commonwealth Statistician found there were 600,000 fit men aged between eighteen and forty-four years. The Commonwealth Statistician deemed men “fit” if they described themselves in good health, neither blind nor deaf, and had not lost a limb. The Prime Minister anticipated a favourable outcome from the referendum and called up eligible men to go into military training camps. 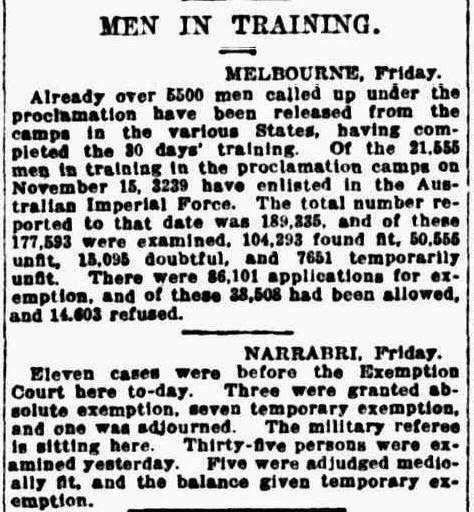 At the beginning of October 1916 the Federal Government, invoking powers under the Defence Acts, required men aged between twenty-one and thirty-five to register for service within the Commonwealth and, if fit, to enter camp for training. I have looked at the history of Avoca , a town in central Victoria, during World War 1. When all men in Avoca deemed eligible were required to report to camp in September 1916, many of those eligible who were found medically fit applied for exemption, mostly on the basis of farming or other commitments. The exemption courts were reported in the papers without comment. 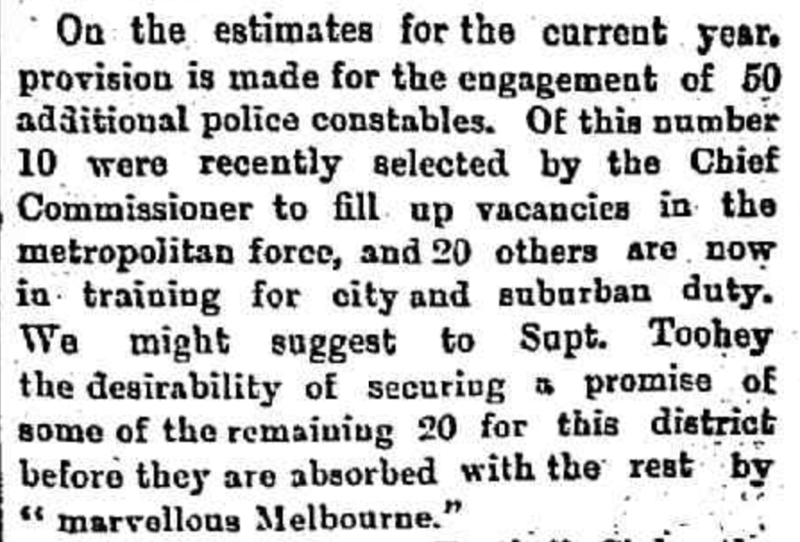 Calling up eligible men perhaps drew the attention of voters to the implications of conscription and provoked them to vote no. 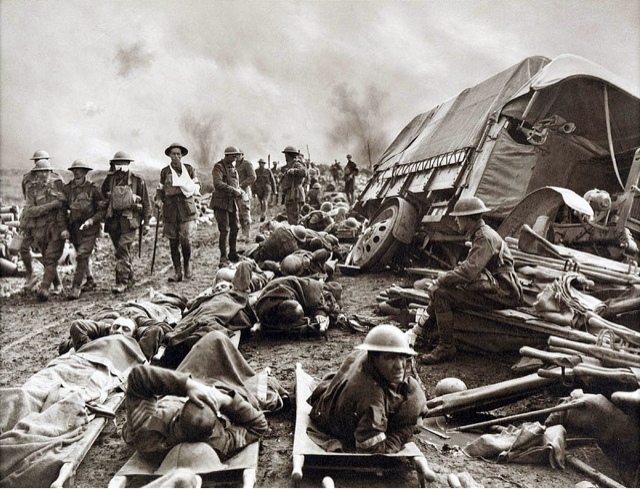 121 men were medically examined for military service in Avoca in October and November 1916. Of these, 69 were found fit for military service. Fifty-four of those applied for exemption, about 80% of those fit and eligible. This proportion is in line with the national averages. 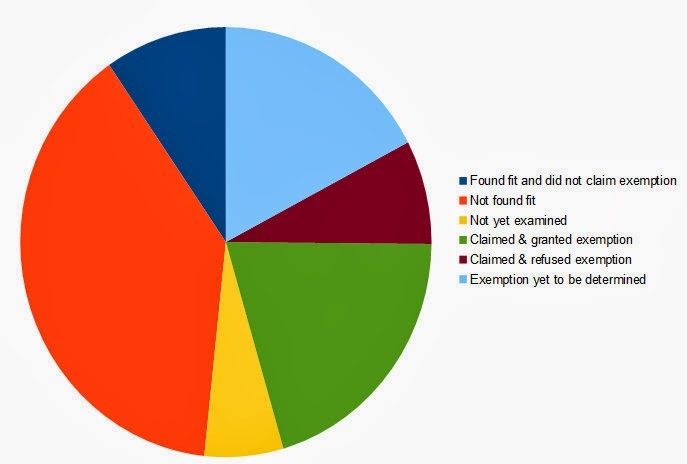 National proportions of those claiming exemptions were: 62% of those examined, or 80% of those found fit. 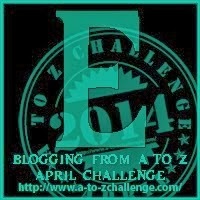 No legal representation was allowed at the exemption courts. Some men, though granted exemption, nevertheless subsequently enlisted. 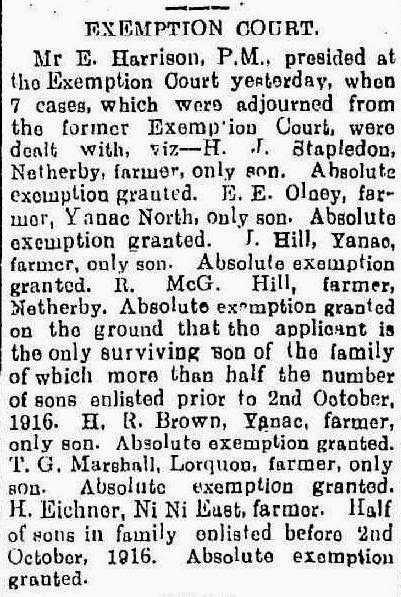 A man from the Avoca district, Stanley William Smith, a farmer from Homebush, who applied for and was granted exemption to 28 February 1917 was one of these. 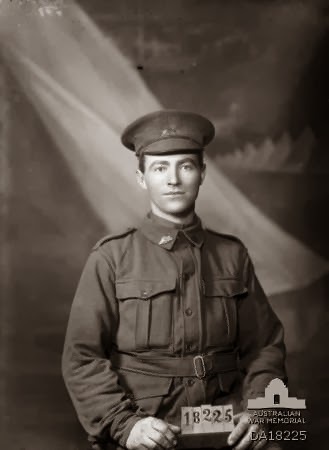 He enlisted on 28 April 1917, served with the 60th Battalion, was wounded on the road to Amiens, and died of his wounds on 9 August 1918 aged 26. He is buried at Vignacourt British Cemetery, Vignacourt, Somme, France. Of the 86,101 applications for exemption Australia wide, 38,508 were allowed and 14,803 were refused. The result was that of the 189,335 men who reported in response to the 1916 proclamation only 18,192, under 10%, were found fit and did not claim exemption. 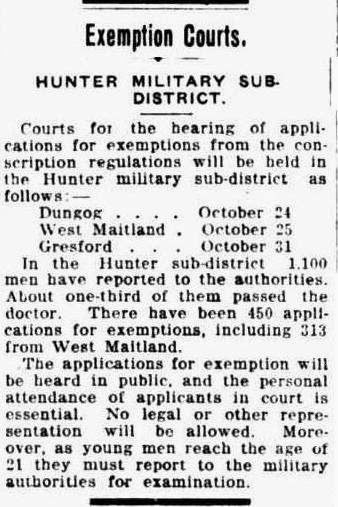 If a member of your family was eligible for military service in 1916 and had not enlisted by October 1916 it might be worth your while to search local newspapers for reports of the exemption courts. Avenues of Honour planted during and after World War I are an Australian innovation. 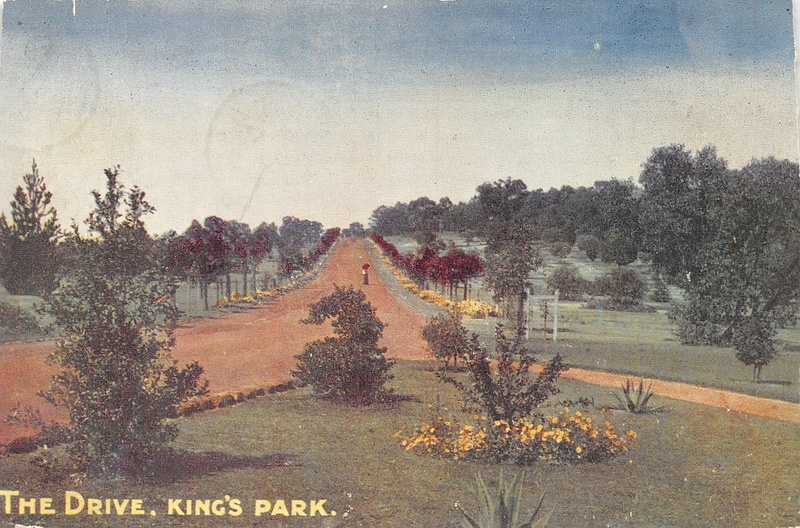 The avenue at Ballarat was one of the first. 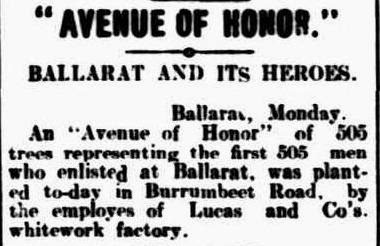 The young women employees of a Ballarat clothing firm, Lucas and Company, planted a tree for every soldier who left Ballarat to serve in the Great War. The avenue runs from the city westerly for 14 miles (over 20 kilometers). The first 505 trees were planted in June 1917. 3,900 trees altogether were planted. 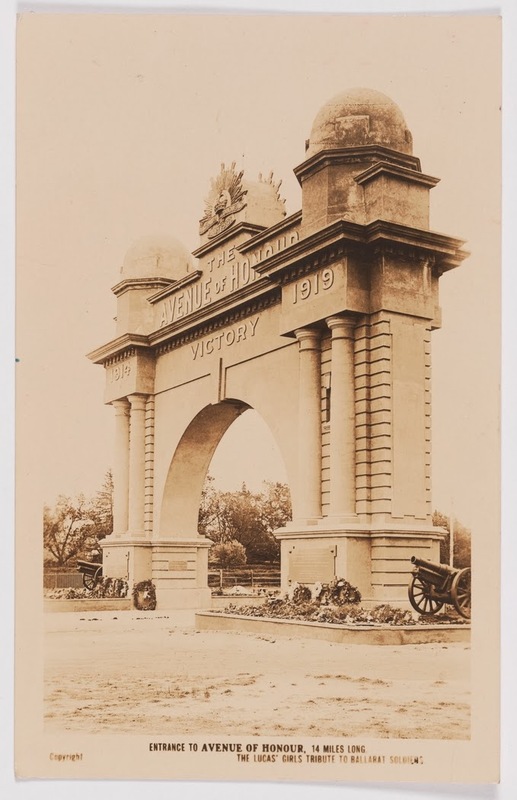 The Lucas girls also raised funds for an Arch of Victory at the beginning of the avenue. The Arch was opened by the Prince of Wales on 2 June 1920. 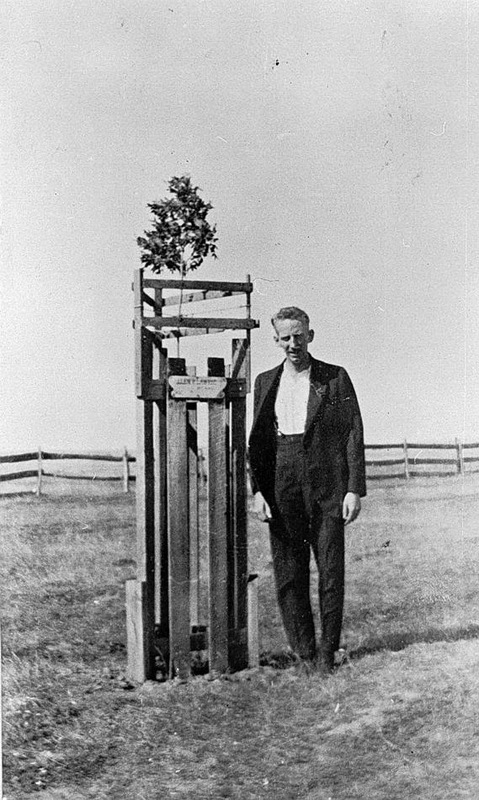 One of the men was Alan Lawrie who is pictured standing next to his tree. 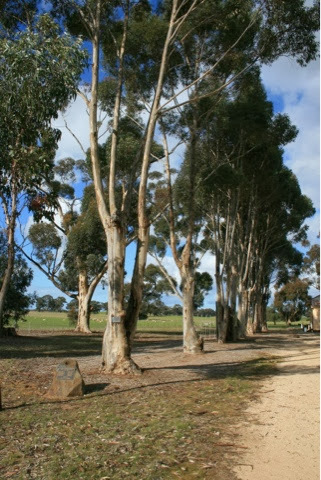 My husband’s grandfather Cecil Young and Cecil’s brother Jack have their names listed on a plaque with a small avenue of eucalypts planted in the grounds of the former school of Lower Homebush near Avoca in Victoria. At Avoca nearby, an avenue was planted, but most of the trees have died . There presumably was a list of the men who were commemorated but I don’t know where that list is. George Wilkins (1857 – 1944) was the school teacher at Homebush and married to Charlotte Young (1861 – 1925), my husband’s great grand aunt. After Charlotte’s death, George married Laura Squires (1878 – 1970). George Templeton was 22 1/2 years old when he enlisted in August 1915. ( http://recordsearch.naa.gov.au/scripts/Imagine.asp?B=8098926 ) He died in Belgium of wounds received in action at Polygon Wood in September 1917. 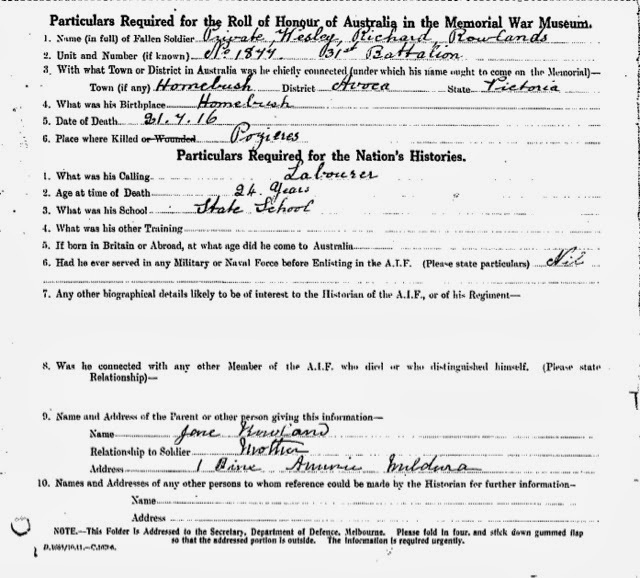 Roll of Honour circular from http://www.awm.gov.au/research/people/roll_of_honour/person/R1666033/ . There are 19 men called Frederick James who enlisted in World War 1 and I have not identified which of these was the visitor at Homebush. George Templeton and Wes Rowlands are remembered in the Avenue of Honour in the grounds of the former Lower Homebush State School. John Young was my husband’s great grandfather. With the birth of the twins at the Lamplough rush of 1860, the family didn’t move on. George bought land and the family settled in the district. John worked as a miner. He travelled to New South Wales and, according to his death certificate, spent six years there. In Parkes he met a widow, Sarah Jane Whiteman née Way. They married in Melbourne on 26 September 1894 at 430 Bourke Street according to the rites of the Church of Christ. Their residences stated on the marriage certificate was that he was living at Bowenvale and she was at the Mechanics Hotel, Bourke Street. Sarah Jane had two children by her first marriage, Robert born 1883 and Mary Ann Whiteman, Mary Ann was born on 19 August 1884, seven months after Sarah Jane’s first husband died of pneumonia. Sarah Jane had a third child, Jack Walsh Whiteman born 13 August 1894 at Parkes, just weeks before her marriage to John Young. The child was born to an unknown father and stayed in Parkes to be brought up by Sarah Jane’s parents and sister. He was renamed Leslie Leister; Sarah Jane’s sister Eliza marrying Robert Leister and the two of them brought up the boy. Sarah Jane died of following the birth of Cecil on 6 July 1898 at Rokewood. The two young boys were brought up by John’s sisters. In particular by Charlotte who had married George Wilkins and lived at Homebush, near Avoca. The boys also spent time with Harriet who had married William Richards and lived at Clunes. The era was not one where widowed fathers brought up their children. John continued to work as a miner at Bowenvale and Betley just south of Dunolly. Sarah Jane’s oldest two children stayed very close to the Young family; for example visiting Charlotte and writing frequently to their two young half-brothers (we have a collection of post cards from the young Jack Young which he collected through his child hood). 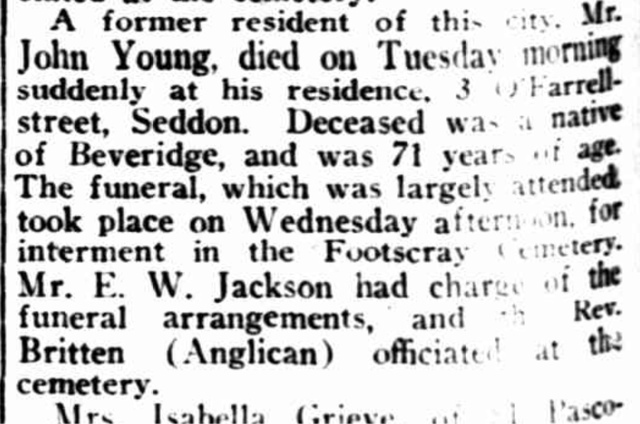 At the end of his life, John Young lived with his step daughter Mary Ann and her second husband, Henry White Nichols, in Henry’s house in Seddon, also known as Yarraville. According to the electoral rolls, John was still living at Betley in 1924. I do not know of any connection to Beveridge as mentioned in the obituary. John died on 23 October 1928 after a three month illness from arterio sclerosis and cardiac failure. He is buried at Footscray cemetery. John Plowright was born 1831 in Kings Lynn, Norfolk to William Plowright (1791-1869) and Sarah Ann née Jackson (1796 – 1864). He was the fourth of eight children of the couple and in addition had an older half-brother from his father’s first marriage. Austin Street has changed significantly from the 1840s but remnants of an old wall are standing based on Google maps street view http://goo.gl/maps/r3DDZ. Norfolk Street was one block away from Austin Street (Google maps link ). More buildings from the 1840s would appear to survive although I have not identified Mr Ayre’s house (Google street view link ). 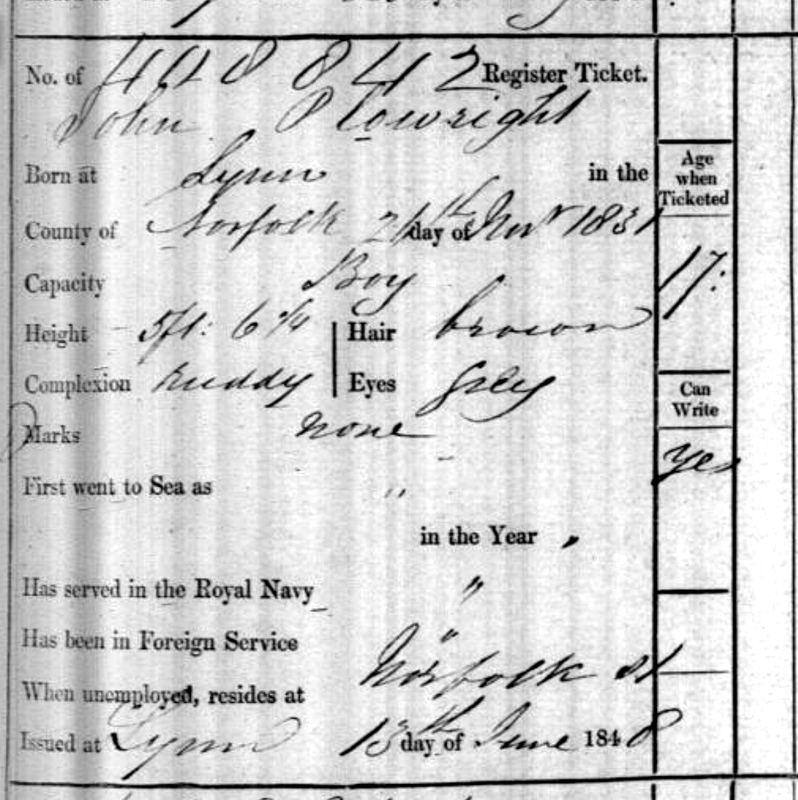 In 1851 John Plowright was in London, a seaman boarding with a number of other young men also from Lynne in Shadwell in London. He had signed on as a seaman with the rank of boy at the age of 17. When he was admitted to Maryborough Hospital in 1873, John Plowright stated he had been in the colony for 20 years arriving on the Speculation. His occupation was as mariner. The Maryborough hospital collected information on port of embarkation, name of ship, number of years in colonies. This information was collected apparently as part of a disease tracking program. As there were no passengers I assume he came as crew. There are no reports that I can find in the newspapers of crew desertion from the Speculation. John Plowright married Margaret Smyth (1834-1897) on 19 November 1855 at his residence at Magpie near Ballarat. Margaret had arrived on the Persian in April 1854. She had been born in Bailieborough, County Cavan Ireland. Her father William Smyth was a farmer. her mother was Mary née Cox. retrieved from http://www.ballaratgenealogy.org.au/art/davies.htm Letter transcripts contributed by Jacqui Cunningham to the Ballarat and District Genealogy Society. Frederick Harold born 1881 was adopted. No birth record found. 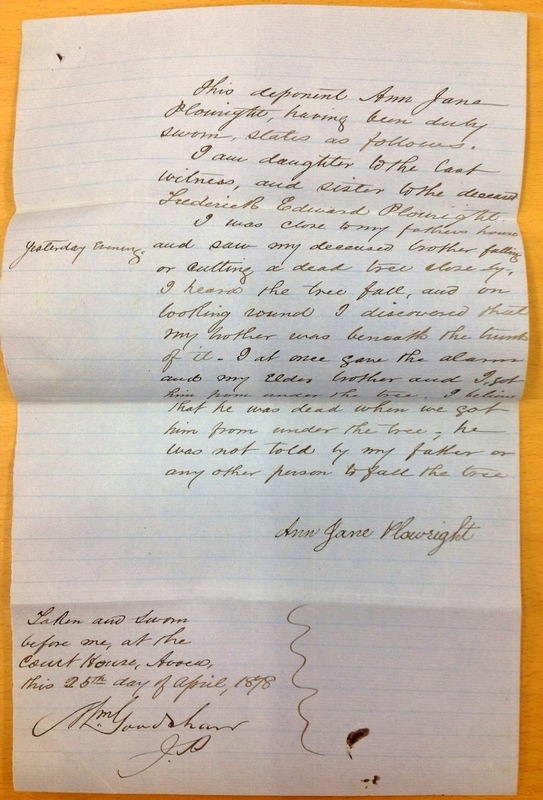 In the probate file of John Plowright he is described as adopted son and no blood relation. In 1872 Margaret was admitted to Maryborough Hospital. 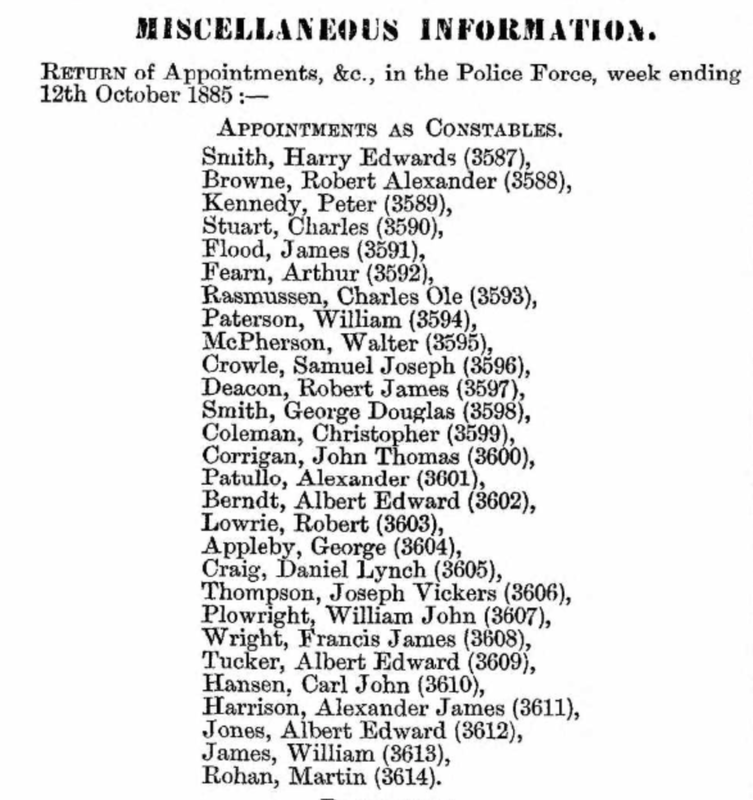 John was admitted a year later in 1873 and again in 1884. In 1878 tragedy struck the family when Frederick died while cutting down a tree. He died on 24 April and a magisterial inquiry was held the day after. The file of the inquiry contains statements from John and his daughter Ann Jane. 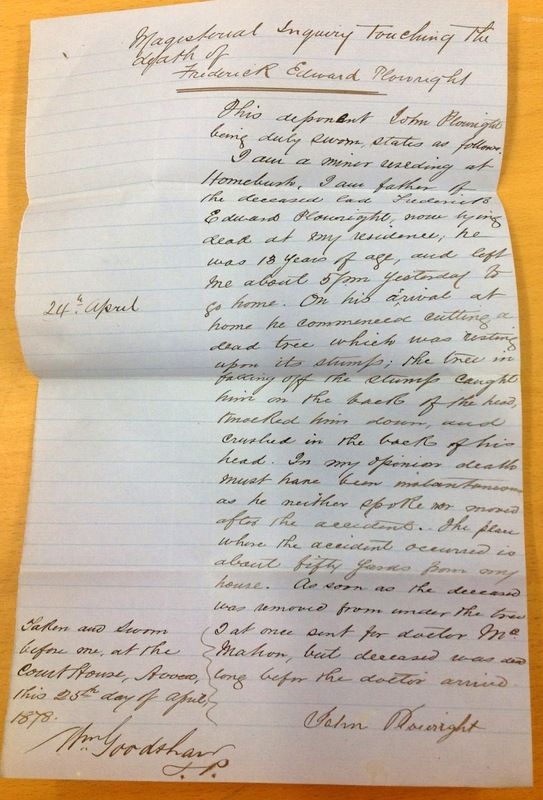 Statement by John Plowright to magisterial inquiry touching the death of Frederick Edward Plowright held at Avoca on 25 April 1878 from inquest file held by Public Record Office of Victoria VPRS 24 number 372 of 1878 (male). 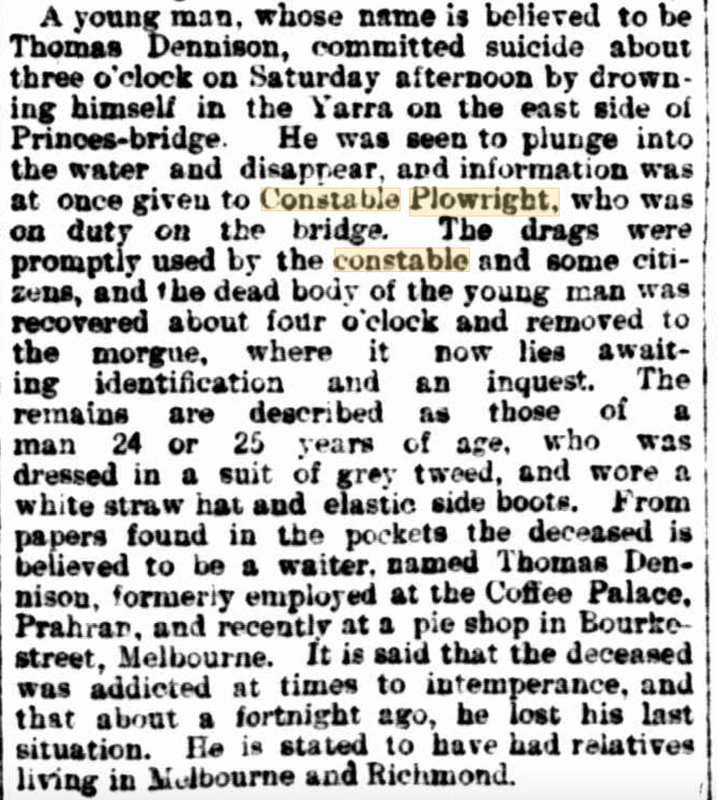 The death of Frederick was widely reported; mentions appeared in the Wagga Wagga Advertiser, the Launceston Examiner as well as the Argus. John’s wife Margaret died of Brights Disease, dropsy and exhaustion in 1897. She is buried in the Avoca cemetery. In the last years of his life John continued to live at Lower Homebush and had a carrier business. John died at Homebush Lower on 8 January 1910. The cause of death was given as pneumonia syncope. Pneumonia is a “Lung inflammation caused by bacterial or viral infection.” Syncope is “Temporary loss of consciousness caused by a fall in blood pressure.” He had been ill for six days and Dr Charles G Grimm had last seen him the same day he died. The death certificate informant was John’s son William John Plowright of 27 Hannover Street, Windsor. He gave John’s occupation as miner. He stated that John’s father was William, a tailor. He didn’t know who John’s mother was. He knew John was born in Lynn, Norfolk, England and stated he had been 55 years in Victoria, that is arriving about 1855. John was buried at Avoca cemetery on January 10th. The undertaker was J. Classen. The minister of religion was Reverend Tuckfield, a Methodist minister. Coincidentally Tuckfield is related to another branch of the family tree. John had made his last will in 1902. He divided his estate into sixths. Each child received a sixth except for Samuel Joseph Smyth Plowright who received two one sixth shares. His two oldest sons were appointed executors. His estate did not have any real estate but personal effects amounted to £204 11 shillings one penny. This was mainly in cash with the exception of furniture valued at £12. 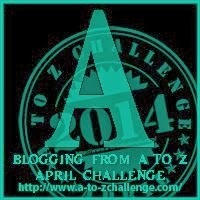 Probate was granted 2 April 1910. (Probate files held by Public Record Office of Victoria reference 114/702). Cecil was the grandson of one of the earlier miners of the Avoca district. He served in World War 1. George Young, a miner, had arrived at the Lamplough Rush near Avoca in about 1859 with a wife and two young children. 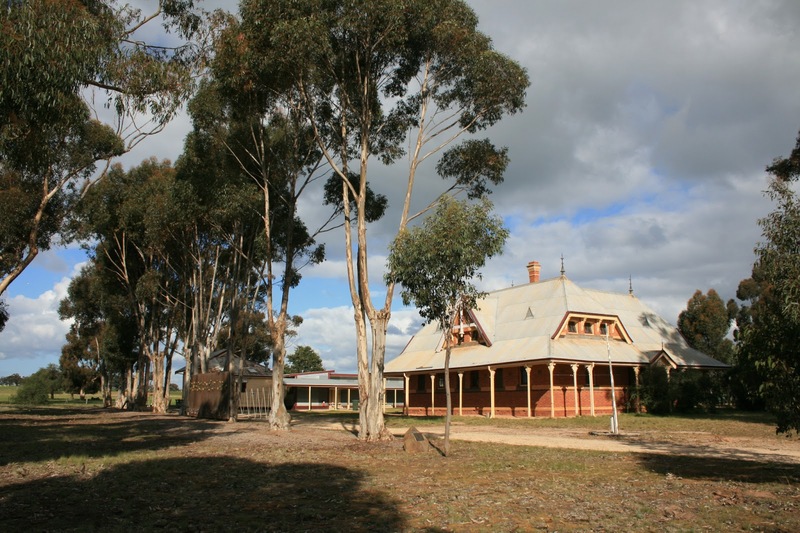 A third child had been born and died at Beechworth. John had been born in 1856 at Dunolly and Alice in January 1859 at White Hills near Maryborough. Twins Charlotte and Harriet were born in July 1861 at Lamplough. Although the rush was moving on, perhaps the burden of four young children including new born twins persuaded George and his wife Caroline to settle. George took up a small portion of land and continued to mine at Lamplough. He and his wife had thirteen children. She died in 1879 at the age of 43 leaving 8 children, the two youngest being one and three years old. It would appear John, who was then aged 23, took on some responsibility for helping with his siblings while probably working as a miner locally. His sister Alice was married a year later, Harriet and Charlotte married in 1881 and 1882 respectively, and Maria was married in 1884. It seems that between about 1887 and 1894 John Young was working in New South Wales. At Parkes he met the widow of a miner, Sarah Jane Whiteman. They married in Melbourne in 1894. She already had two children Robert and Mary Anne aged about eleven and ten at the time of her second marriage. John and Sarah Jane had one daughter who died in infancy and then a son John Percy (Jack) was born at Timor in 1896. A second son, Cecil, was born at Rokewood in 1898 but Sarah Jane died in childbirth. As the head teacher of Homebush George Wilkins played an active role in the community: he was on the local cricket team; he played the cornet in the local band; he was frequently called to take on the roll of MC at local gatherings. George was Lieutenant in charge of the local cadets.2 During the war George Wilkins took on a leading role organising the Soldiers’ Comforts Fund of Homebush. After the war he helped to form the local branch of the Returned Soldiers’ League. Cecil enlisted in the AIF in December 1915.3 He was only seventeen and a half but he advanced his date of birth by one year. He described his trade as a butcher but was not an apprentice. 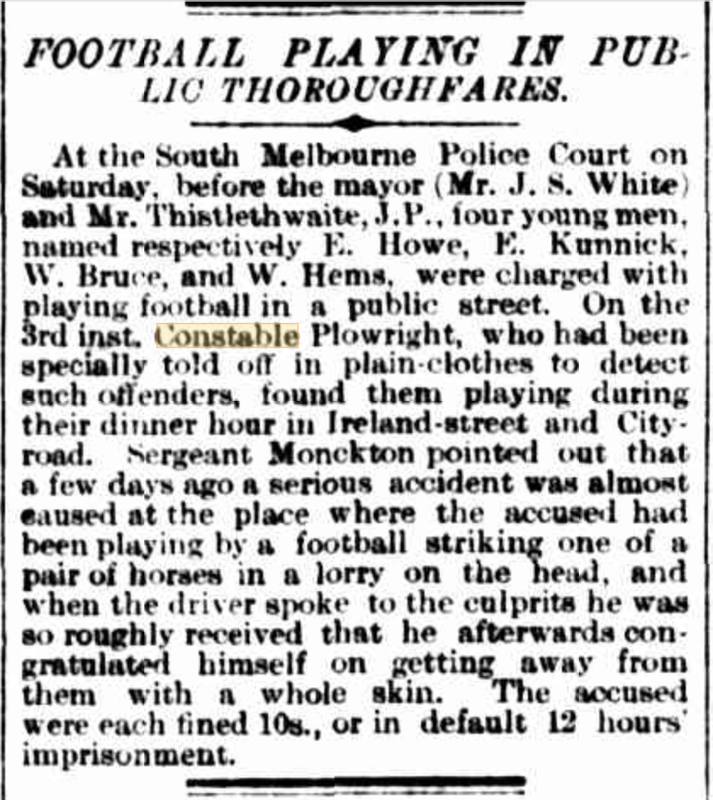 He declared he had served with the senior cadets at Footscray for 9 months (no kit had been issued as the annotation stated it was an exempt area). He was only a small man: 5 feet 5 1/4 inches tall weighing 123 1/2 lbs (just under 9 stone or 60 kg). He had two tattoos: a ship and two clasped hands on his left forearm, a rose with “Myrtle” on his right forearm. In April 1916 he was appointed to the 24th Battallion, 13th reinforcements. He embarked from Australia in July 1917 arriving Plymouth, England in September and departing Folkestone, England in November 1916 and taken on strength in France 21 December 1916. He was with the 24th battalion reinforcing the second division. He was sick with scabies in hospital in mid-June 1917 and rejoined his unit at the end of the month. He was wounded in action on 20 September 1917 with gunshot wounds to his right ear and his right thigh. He was transferred to an ambulance train and three weeks later to hospital in England. In January he was discharged to furlough and later that month he was admonished by a major following disorderly conduct and refusal to obey an order given by the Military Police. In April he was returned to Australia disembarking in early June and he was discharged from the AIF at Melbourne as medically unfit on 26 July 1918. 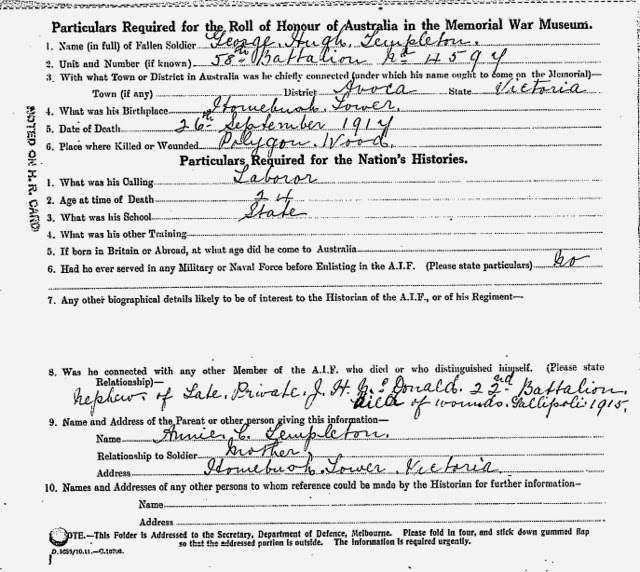 The last stamped annotation to his AIF file is “Application for war service leave gratuity passed Feb 28 1919”. By August 1918 he was in Homebush staying with his aunt and uncle George and Charlotte Wilkins. 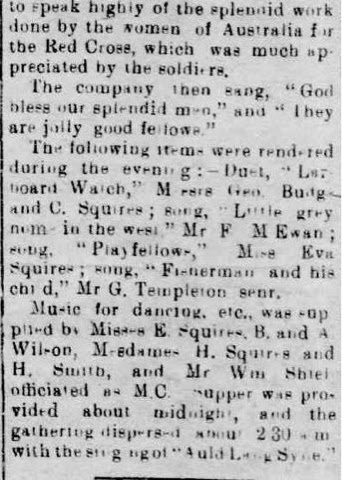 There he entertained a large number of guests together with Pte Allen, a friend of his from his war service, at the Public Hall, Homebush. Guests were mainly members and supporters of Homebush Soldiers’ Comforts Fund. The object of Privates Young and Allen “being to show their appreciation of the good work that is being done by the above body”. Cecil’s brother Jack also served in World War I. 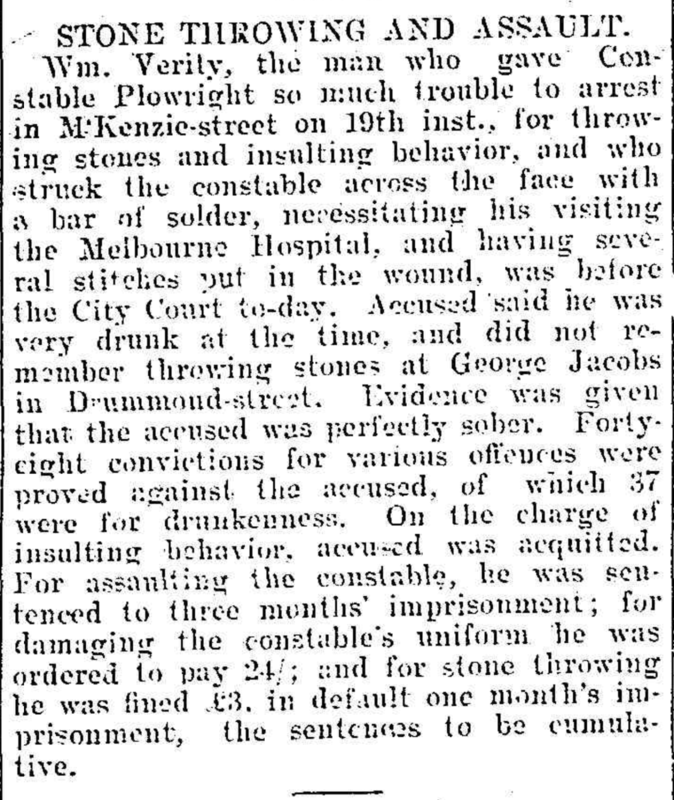 He enlisted in Melbourne on 3 October 1916. He was twenty years old. He trained as a signaller, and went to France in January 1918. He was wounded in action, gassed, in August 1918. In November 1918 Jack Young died of pneumonia in England. He is buried at Brookwood War Cemetery. John Young, his father, completed a card for the Roll of Honour of Australia. Cecil and Jack are remembered locally on the Homebush Honor Roll unveiled in 1917 and on the memorial placed at the Homebush school in 1993. They are not remembered on any of the other local Avoca memorials. Cecil is my husband’s grandfather. The school at Lower Homebush where Cecil and Jack Young lived with their aunt Charlotte and her husband George Wilkins. The Avenue of Honour can be seen. Photographed September 2011. 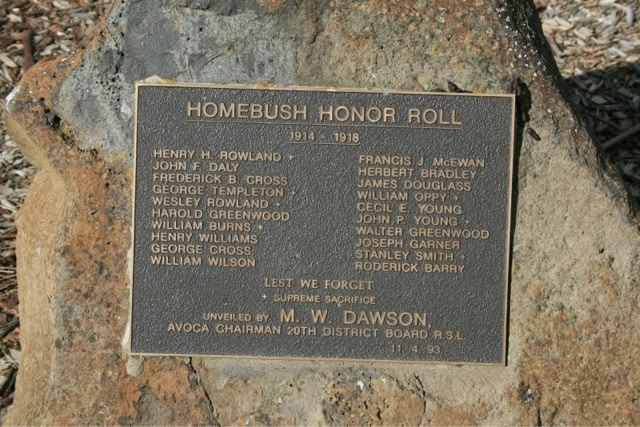 The plaque at the Avenue of Honour at Lower Homebush School.